Last week I promised you some recipes for marinated, grilled chicken. This is probably one of the most frequent items on our dinner menu. Chicken is so versatile! I think that if I had to, I could come up with 365 ways to cook it! I’m not offering 365 chicken recipes (hmmm, maybe I should write a cookbook? ), but here are three of our favorites. If I ever feed you dinner, there’s a good chance you’ll be eating one of these! How many of us are starting the new year on a diet? Whether you’re counting carbs, calories, and servings, or just trying to “eat a more healthy diet,” odds are that at least one of your new year’s resolutions involves food. Or maybe you hope to be more organized this year. I’m aiming for both–better eating and a saner schedule—so I’ve been going over our calendar, trying to plan out some healthy, easy to make, and inexpensive meals for the coming weeks. Even if we don’t follow my plan (and I’m quite sure we won’t), having some meal ideas thought out can salvage dinner on those days when it seems I don’t even have time to breathe, much less cook. It’s almost September, National Chicken Month. I adore chickens. Put those two facts together, and I have the perfect opportunity to enlighten you with some chicken trivia. 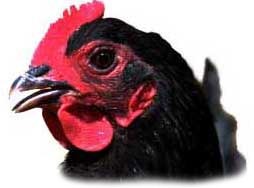 Chickens are the most numerous bird species on the planet. Wild chickens are still found in south Asia, where birders know them as Red Jungle Fowl. There is also a feral population in Hawaii and in other spots around the world. If you want to check “Jungle Fowl” off your life list, you must find one of these wild birds. The weather is hot, so we’ve been eating a lot of salads lately. We’ve also been using the grill a lot, keeping the heat outside and the kitchen cool. Today’s recipe combines both of these features, creating a main dish that’s perfect for summer. Next time you make some BBQ’d chicken (perhaps for an upcoming 4th of July party), throw a few extra pieces on the grill. Anything with a Mexican, Mediterranean, or Asian flavor is fine. Chill the extra meat, remove any skin or bones, and use it the next day in this main dish salad. I love a dinner that can be thrown together in less than 30 minutes, especially when I don’t have to cook a thing. If the salad alone doesn’t fill you up, try serving it with fresh or grilled fruit, quesadillas, or splurge and serve Dulce de Leche ice cream for dessert. Necessity was the mother of invention for this recipe. We were on vacation in Cabo San Lucas, at the southern tip of the Baja peninsula, and I needed something easy to make for dinner in our tiny kitchen. These are the ingredients I found in the supermercado, and they added up to a wonderful Mexican soup! The second time I made it, I added leftover refried beans, and it still tasted muy delicioso. When we got home, I checked online, and found that I’m not the first to have this idea. I guess lime, chicken, and rice just go really well together! Valentine’s Day is coming, and who knows more about being romantic than the French? This month’s recipe is my own take on French cooking. Try serving it with asparagus in browned butter, almond rice pilaf, and a salad of butter lettuce with French vinaigrette dressing. Dip strawberries in melted chocolate for dessert. Don’t forget the candles. This recipe serves four. You can either cook just two pieces of chicken instead of four, or save the other half to reheat in a few days.